And what customers are saying is, they have these existing VMware systems, our product, System Center, actually manages VMware. We do a world-class job of managing VMware, so they can use one pane of glass to manage their legacy VMware environments together with their Hyper-V system. World-class job of managing VMware? Not according to my investigation. And Network World found much of the same. And oh, by the way, you also still need the vSphere Client because SCVMM cannot configure ESX host settings — hardware, storage, networking, resources, etc. Presto! Single pane of glass to manage VMware and Hyper-V. I certainly believe that making our management experience better is something we need to work on, and this is a drum that I have been beating here at Microsoft for a while now. However, I do have some objections with your list. You call out Server core / iSCSI / network teaming configuration – and this is definitely something we need to work on. Initial setup here is much more painful than it should be, especially once you add setup of the various management tools. But, I do question whether maybe you should have seperated “setup experience” from “day to day management experience” – as the latter is what Bob is talking about. Also – if you are using SCVMM you really do not need to use the Hyper-V Manager or Perfmon. SCVMM allows you to access all the functionality of these tools. From SCVMM you can deploy Hyper-V, configure virtual machines and get up and running without ever touching the Hyper-V manager. In fact this is our recommendation. Finally – even if you are using VMware, if you have a number of Windows Server virtual machines, you are highly likely to be using SCOM and SCCM to manage the operating systems in the virtual machines. 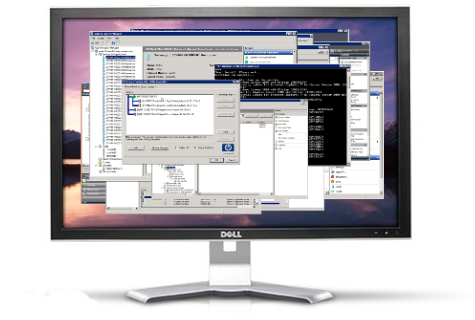 – SCCM (for patching and deployment of guest OSes, but not of the physical hardware). Cast in that light, I have a hard time buying the argument that Hyper-V has a worse story for day-to-day management of our environment. That’s an interesting position — separating (day to day) virtualization management from install/configure tasks — but I’m not sure it is legitimate. You might be able to frame this in the context of front line NOC technicians vs. systems engineers. But that’s really not the point I am trying to make. Thanks for clarifying what Bob Muglia really meant. It’s really hard to decipher the ambiguity coming from Microsoft execs these days — I bet the analysts covering virtualization would appreciate small details like that. See also: Kevin “24%” Turner. – The simple, real-time CPU chart in SCVMM does not replace perfmon functionality. – VMware shops do not need SCCM — Update Manager patches hosts as well as VMs. Thanks for your feedback, but I am standing by my assertions. Thanks, Rick, glad you enjoyed it. I feel the same way regarding your post and have similar feelings on MS Virtualization Products, I like to compare them to herpes. “Sure is fun getting them, but hell living with!” lol. Great post Eric. In response to Ben’s comment SCCM and SCOM need to used with vSphere client as management tools I completely disagree. Our environment consists of 16 ESX servers and around 150 VMs. Matt, thanks for that affirmation regarding System Center. This isn’t the case if you’re using SCVMM to manage a hyper-v cluster and you want to provision a non-clustered VM. SCVMM won’t let you create non-clustered VMs on a Hyper-V node that’s part of a cluster, so you’ll still need to use Hyper-V Manager. I can’t stop laughing on the picture !!! I am curious, what does mister Muglia have to say about your findings? Wow, clearly an exaggeration just to make a point for the author’s favorite team and a waste of our time. If I already own hundreds of copies of Windows Server 2008 R2 then I have hundreds of copies of a hypervisor at my disposal. Why should I continue to direct my shrinking budget on VMware when I can leverage what I already own and it is good enough to meet my needs? Some people will choose Hyper-V. Looks like you are one of them. Eric, don’t underestimate the power of the software bundle. If a company has SA in place (Microsoft Software Assurance), then the package of all the System Center products is pretty cheap. There’s a System Center Essentials bundle (small companies) as well as a System Center Enterprise option (large environments). It becomes a hard sell if you’re already paying for this and want to use or keep on using VMware products. I agree that the large set of tools required and the additional requirements (clustering, Windows domain membership for your hypervisor) can and will be a pain. It also requires some very good IT people to setup properly. But the decision makers don’t care about that, they only look at their spreadsheets. And the IT guy has to suffer. I recently talked to someone who hinted at this. He got some students for a SCOM course who have been going through this. Great post as usual. What I have really loved here how you made Microsoft shoot them self in the foot and admit that they have a horrible setup complication. one year after your post and they still suffer the same setup complexity. I see it every where that my company go to conduct a POC of both products. Our VMware team can close a POC in two days, where our Hyper-V team take a minimum of a week. This has been repeated and even when Microsoft is directly involved in the POC it does not shorten the gap much. Thanks, glad you liked it. I’m not surprised it takes your crew much longer to set up Hyper-V POC, it is just much more complex.